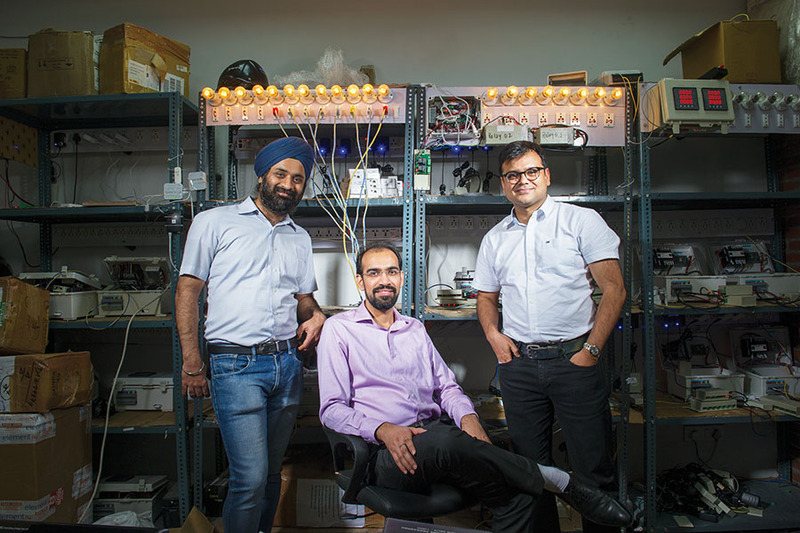 At a time when sustainability is a buzzword globally, three IIT-Delhi engineers, Rahul Bhalla, Vishal Bansal and Amarjeet Singh, all 38, are helping businesses conserve energy through their startup, Zenatix Solutions . Founded in 2014, it provides Internet of Things (IoT)-based automation solutions to retail outlets and banks, and then drives intelligent controls centrally through AI, to automatically plug power leakages. “When we started, we realised there was no hardware to get data from physical assets [like ACs, refrigerators]. So, we started hooking external hardware to the existing infrastructure to get data to deliver intelligent controls,” says Bhalla. Today, Zenatix collects 80-100 million data points every day. The technology works through sensor-based controls. For instance, the sensor detects the number of people in a retail store and automatically increases or decreases the cooling of the air conditioner. This results in at least 5-15 percent reduction in electricity consumption. Zenatix also makes use of AI and machine learning to avoid machine breakdowns. It predicts the health of physical assets through an algorithm that the team has developed. Once data comes in, it raises an alarm when a machine is about to breakdown. Bhalla says Zenatix provides a managed solution, a combination of both hardware and software, to its clients. “The hardware required for every location includes sensors [bought from third parties], actuators [to control equipment] and a controller [pulls data from the sensor and uploads it to the cloud]. The software is a cloud, which is managed from a central location; the client can get access to energy consumption in every location in real time,” he says. Presently, Zenatix has 15 customers, including Domino’s Pizza, Vodafone retail stores, and Mother Dairy. Some, like banks, retail chains and QSRs, are engaged on a pilot basis. “We charge companies in two ways; first is the one-time installation charge for the hardware and then the annual subscription for the software. We have now deployed our technology in 1,600 locations in more than 100 cities and are adding almost 200 sites every month,” says Bhalla. In May 2018, Hero Electronix acquired the startup for an undisclosed amount. Last February, Zenatix raised $1.18 million from pi Ventures and existing investor Blume Ventures also participated.